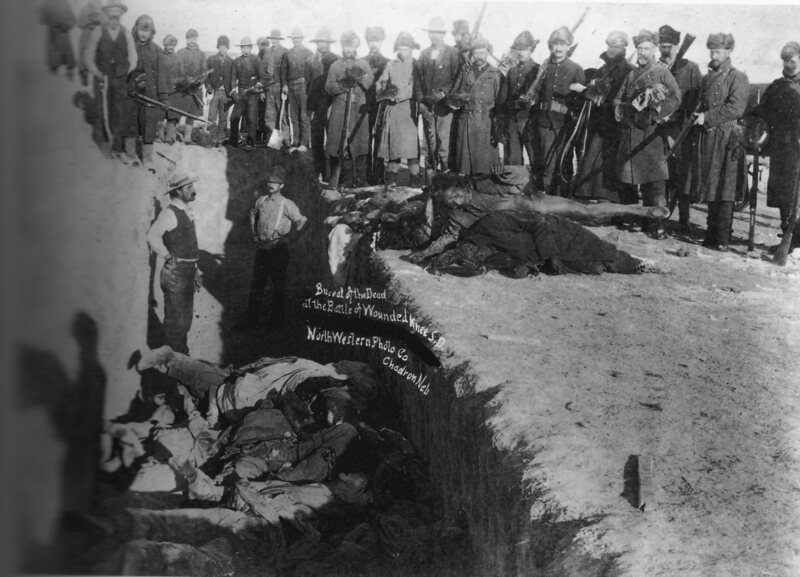 Mass grave for the dead Lakota after the massacre at Wounded Knee Creek. The Ghost Dance War was an armed conflict in the United States which occurred between Native Americans and the United States government from 1890 until 1891. It involved the Wounded Knee Massacre wherein the 7th Cavalry massacred 153 Lakota Sioux, including women, children, and other noncombatants, at Wounded Knee on 29 December 1890. It ended when Sioux leader Kicking Bear surrendered on 15 January 1891. In an effort to remind the nation of this incident, and the historic government program against Native Americans, the American Indian Movement (AIM) occupied the Pine Ridge Reservation near Wounded Knee in protest against the federal government on 27 February 1973. A 71-day standoff between federal authorities and the AIM ensued. The militants surrendered on 8 May. The Ghost Dance was a Native American religious movement that occurred in the late 1800s, often practiced by the Sioux Indians. It often consisted of a circle dance, invented by the Indian leader Wovoka, or better known by his white name Jack Wilson. Wilson was convinced that God talked to him and told him directly that by practicing the Ghost Dance, they would wash the evil out of their lives and they would be impervious to disease, famine, and old age. This religion quickly spread throughout the entire west and Native American tribes. This dance was given this name by white settlers who were frightened by this spiritual dance, saying that it had a ghostly aura around it, hence the name. This started the push to bring US troops into the Dakotas where the Sioux were most prominent and where the Ghost Dance was being practiced the most. After the Wounded Knee Massacre, there were several other small skirmishes involving the Sioux and the US Government, but the most part hostilities ceased, although tensions are still high to this day. Much to the dismay of Native Americans, twenty US troops were awarded the Medal of Honor for their actions on that day. Native Americans were outraged about this at the time, and have pushed to get these medals rescinded, but nothing has been done to this point. In more recent years, there was a takeover of the Wounded Knee Memorial by militant protesters. There was a standoff between these protesters for several months, but they ended up surrendering peacefully. Welch, James and Stekler, Paul. Killing Custer. W. W. Norton and Company, New York, NY, 1994. ISBN 0-393-03657-X.